A transformative, interdisciplinary food story that honors the work of women to create a just and sustainable food system. Ananya Dance Theatre • “Roktim” • Photo V. Paul Virtucio. L-R back: Chitra Vairavan, Renée Copeland, Kealoha Ferreira, Jay Galtney, Lela Pierce, Magnolia Yang Sao Yia. L-R front: Leila Awadallah, Ananya Chatterjea, Hui Wilcox, Prakshi Malik. Ananya Dance Theatre is creating its new work, “Roktim: Nurture Incarnadine,” about women’s work with land, seed, food, and nurture! 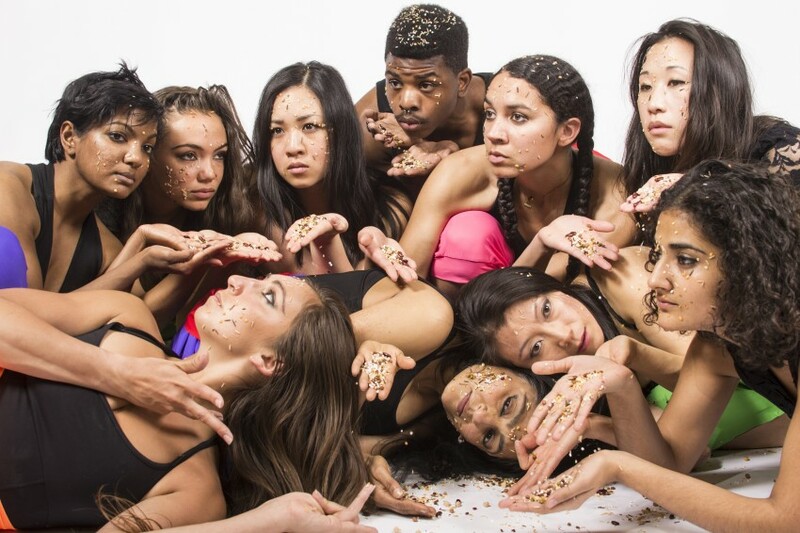 We will present “Roktim” with multiple performances by 11 dancers at The O’Shaughnessy at St. Catherine University in St. Paul, September 18-19, 2015. Women’s loving labor produces the elements of our sustenance. Women from global societies have also defended the land and eco-systems with their lives and their continued work from the onslaught of aggressive industrialization. But the food system in which we exist often obscures these stories. Inspired by the Seed Sovereignty Movement and farming practices in local communities of color, choreographer Ananya Chatterjea, visual artist Seitu Jones, and behavioral artist Marcus Young will partner with Frogtown Farm, Afro Eco, and the Indigenous Peoples’ Task Force to produce an evening-length story reflecting and honoring the age-old work of women who cultivate, nurture, and protect land and agriculture with emotional and blood labor to create a just and sustainable food system for our shared future. The O’Shaughnessy offers large print programs, seating for individuals in wheelchairs, along with accompanying companion seating located in the same area, and holds seating for patrons who are hard of hearing or visually disabled. If you have an accessibility request, please explain it to the ticket office and we will do our best to seat you in a location that accommodates your needs. This production will begin and conclude outside The O’Shaughnessy on the front patio. Seniors and Students receive $4 off tickets; MPR, Military, and St. Kate’s Community (faculty, staff, alumnae) receive $2 off tickets. Groups of 10+ save 15% off tickets. *Prices include $2 restoration fee. “Roktim” is supported by a Challenge America grant from the National Endowment for the Arts. This activity is funded, in part, by an appropriation from the Minnesota State Legislature with money from the State’s general fund. This activity is made possible by the voters of Minnesota through grants from the Minnesota State Arts Board and the Metropolitan Regional Arts Council, thanks to a legislative appropriation from the arts and cultural heritage fund. “Roktim” is supported by a grant from the Seward Co-op Community Fund.